After being inspired by the Europe from Europe maps, last night I created a map of the United States, as seen by someone from southeastern Pennsylvania. 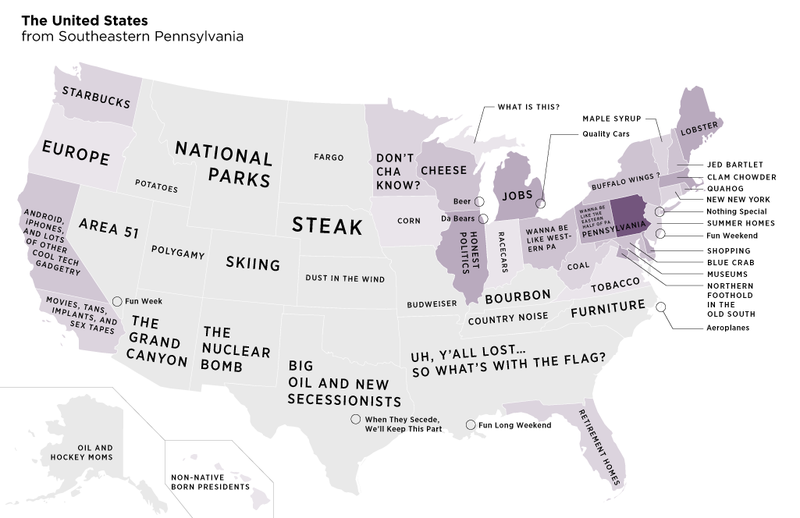 Anyway, these are funny—even if one does not necessarily understand the background to the humour there are enough that even we Americans can understand. The big voting day in November is slowly—or rapidly—approaching. But before we get to the main fight, we have all the small-ring events to tease us. And to whet our appetite for magic walls and holographic projections and all the other technological wizardry that shall amaze and astound us all, we have nice graphics about the primaries. This comes from the New York Times, in particular covering the Delaware primary where Mike Castle, long-time moderate Republican, has lost his party’s primary to a Tea Party candidate. (One wonders what would happen if the Tea Party candidates ran as an actual third party instead of co-opting the Republican party.) In general, the Times has there coverage pretty nailed down. 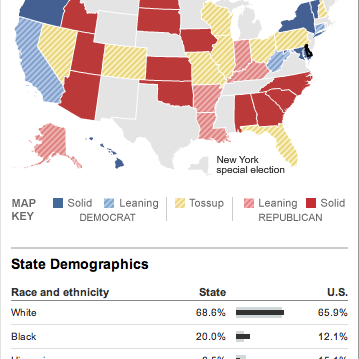 It is worth checking out their site for the mid-terms coming up if not for the news but then for the maps and charts they use to visualise all the data. (And with modern-day polling, how could we ever not have enough data to visualise?) After all, I will probably comment upon their work a few more times before Election Day. First, I think a good if not expected place to start is with the three-dimensional pie chart and map. These two visual elements add little if not subtract from the overall graphic. By putting the ‘No’ vote in the background it is made to appear smaller than the ‘Yes’ vote and can be seen as marginalising that portion of the vote. Furthermore, note the change in the colour of the type for each section of the chart. While the orange and white is certainly a high contrast, the black versus white is even higher. As to the map, I am not an expert in Turkish geography, but this appears to simply be adding a weird three-dimensional effect to the edges of an otherwise flat map. At least I should hope the map is otherwise flat and not distorting the geography. One can always make the argument that a map is not needed to show a single datapoint, in this case the ‘victor’ in the vote. 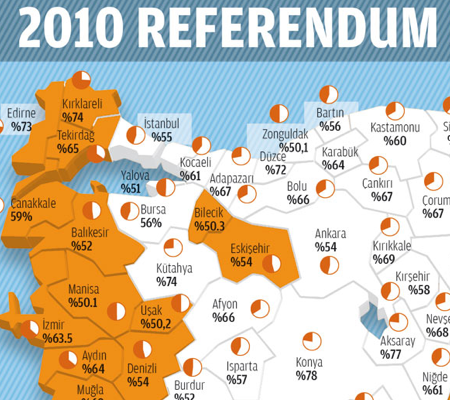 However, from the perspective of an American not familiar with Turkish provinces (assuming they are indeed called provinces), this map is far more meaningful than would a statistically more valuable chart highlighting the discrepancy in the vote. After all the little miniature pies in each province are largely useless except in the most obvious of differences. To actually show and detail the degree of victory a bar chart for all provinces would be more useful. Or perhaps a compromise that would show each province in a colour that reflects the overall victor, yes or no, and the degree to which that camp beat the other through use of a gradient. Would that be ideal for showing the details of the numbers? No, not at all, but it would highlight that while the ‘No’ vote was concentrated along the western and northern provinces—do they share a political similarity because of their bordering on the Aegean or some other reason?—but that the strongest ‘No’ vote was in the very northwest—geographically the most European part—of Turkey, excepting some exceptional province in the centre of the country. None of this, of course, deals with the density of the population in each province, for none of that is known to me as a non-Turkish observer. All in all, it is an interesting piece that puts the news story in more context than I might typically read in a straight, text-only article. It has some flaws, but that might be owing to my perspective as an outsider looking in. This comes from an older article in the Philadelphia Inquirer, but it is new to me. Anyway, it looks at a proposal for high-speed rail in the United States, specifically along the Northeast Corridor, the Washington to Boston route that includes Baltimore, Wilmington, Philadelphia, and New York. Anyway, go figure that we still have trains that run at a snail’s pace, even Acela has a low average-speed. 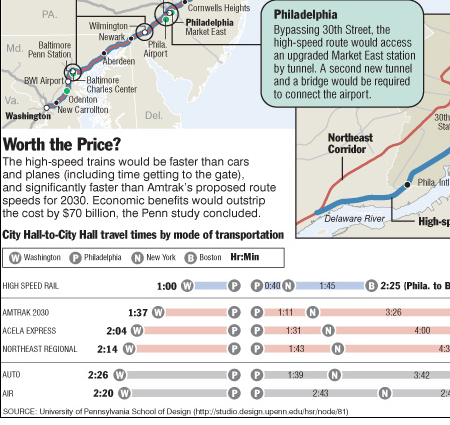 A proposal from a group out of Penn makes for an interesting debate, specifically in Philly a real high-speed route would require boring underneath most of Philadelphia to bypass 30th Street. Perhaps revitalising Market East—depending on how exactly the route would interact with the commuter tunnel currently in place. 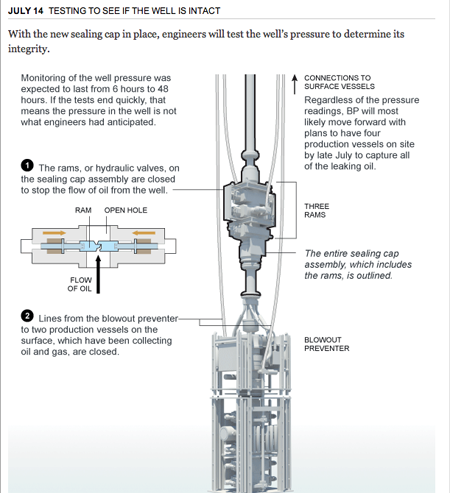 The graphics are simple, basically an annotated map. But the variations in stroke weight and colour help bring contrast to the routes when looking at the entire proposal whereas the proposed route in Philadelphia has little overlap and could have made due with a single stroke. Another interesting piece is beneath in the comparison between travel times from Washington to Philadelphia, from Philly to New York, and New York to Boston. Without looking at cost—thought the article’s second page or graphics does that—we can clearly see that a dedicated high-speed rail system would make it even easier to travel between cities for short holidays or even day trips. Let alone business trips. If Kites Could Fly to the Future, What Would They Find? 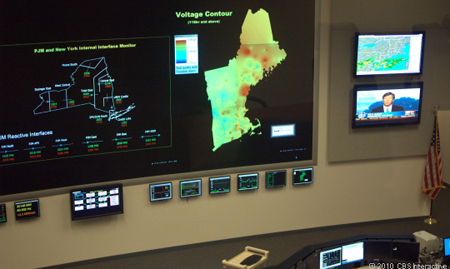 These are photographs from a small series published by CNET that focuses on a power grid control room. 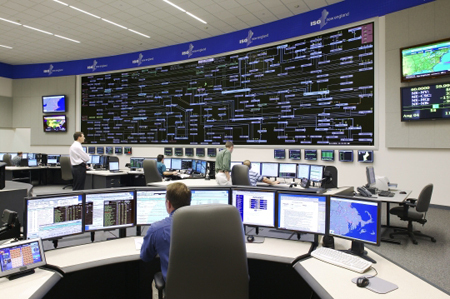 As one can imagine, managing the flow of electrical energy across somewhere the size of New England could be a bit…complicated. And so one can see from some kind of network map (perhaps?) on the main display. At the very least I can make no sense of it. On the other hand, I only wonder what would happen if Homer were sitting behind a bank of those monitors? Author Brendan BarryPosted on 24 August 10 11 November 16 Categories UncategorizedTags charting, CNET, diagram, information design, maps, scienceLeave a comment on If Kites Could Fly to the Future, What Would They Find? Perhaps the 21st century version of the Pentagon papers, the ‘War Logs’, as they are being called, consist of some 90,000 classified documents centring on the Afghanistan War. While they do not paint a necessarily different picture from what is known publicly, the War Logs do provide interesting glimpses into the war, a war that, like any other, is a messy and ugly business despite the polish of design, propaganda, and the media. To put it differently and perhaps in another sense, the War Logs offer depth down to the ground-level, unpleasant details of warzone combat. But the documents lack an overall, strategic-level—I daresay antiseptic—breadth of understanding. The War Logs suffer from a lack of the broader context—but they do provide useful and interesting stories, vignettes, and anecdotes that flesh out the story we all broadly know. 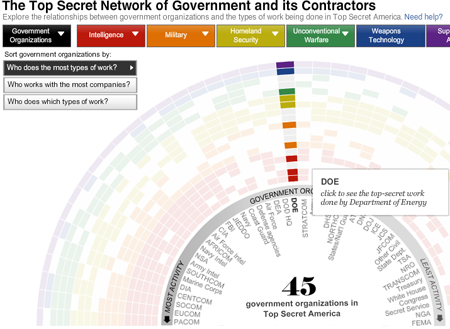 The Guardian is one of three main newspapers that received the leaks in advance; the others were the New York Times and Germany’s Der Spiegel. And one of the things the Guardian did was create an interactive piece exploring improvised explosive devices (IEDs) and where and when they occurred in Afghanistan from 2004 to 2010. While I understand the use of Google maps, I always see the map as a distraction. 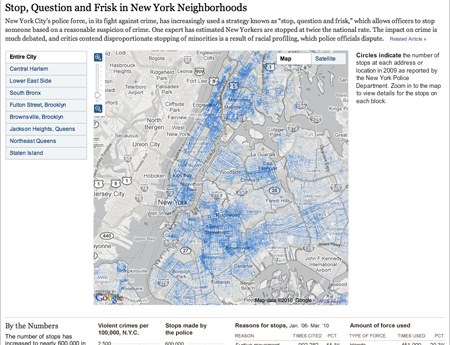 For example, why in a story about Afghanistan do I need to see a map that includes the small cities of India. To some degree, the same can be said about the bordering countries like Iran and Pakistan—but as those countries are along the border and are to varying degrees involved in the action, their inclusion can be understood on a case-by-case basis. 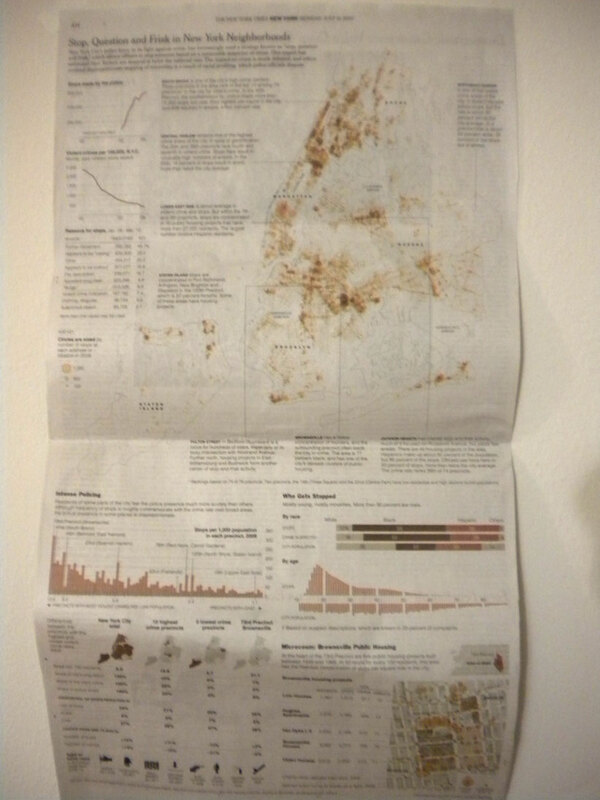 Choice of map aside, the piece highlights the detonation of IEDs as circles whose area reflects the number of casualties. The colour of each circle represents which ‘group’ of people had the most casualties: civilians, Coalition soldiers, or Afghan soldiers. However, by reducing the data to a single circle of a single colour, we lose the potential added depth of breaking down the event into the deaths of soldiers and civilians alike. Do I have an instant solution on hand? No. But I do note that if one clicks on the specific event, a window appears that breaks down the event into said figures. One of the more interesting things about this whole story is that at least the Guardian is putting out the data as a spreadsheet. Perhaps in the near to intermediate future those with the time and inclination will take that information and make something truly interesting for the public’s consumption.